Low Cal Palak Paneer is a very tasty and healthy recipe. 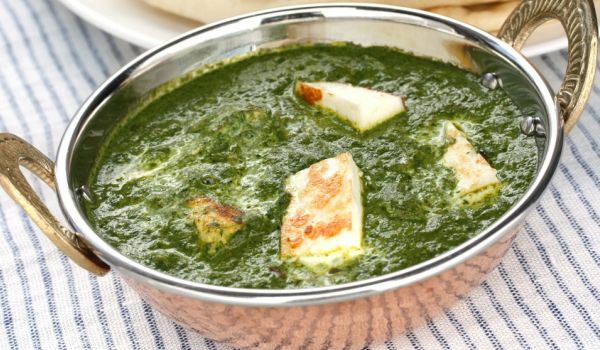 Learn how to make/prepare Low Cal Palak Paneer by following this easy recipe. Wash and drain spinach; cook it in the medium heat. Now drain the cooked spinach; allow it to cool. Grind it with ginger, garlic, flour and chilles. Heat a nonstick pan and fry cumin seeds. Sprinkle Asafetida and ground spinach; stir it well. Mix cinnamon clove powder, turmeric powder, salt and sugar. Cook (covered) in simmer for 3- 4 minutes. Spoon the content into serving dish. Serve it hot with wheat flour phulkas or steamed brown rice.